Save the Post Office is a fantastic website that details all you could ever want to know with regard to keeping your local post office open. This entry discusses the ways in which I've determined I would like to "save" post offices -- that is, preserve their memories through physical items you can actually obtain from your local post office before it closes. I'll share why it matters to me and how you too can get involved. If you'd like to contribute your own postmarks / stories / signage, allow me to recommend getting in contact with (or joining!) the non-profit Post Mark Collectors Club (PMCC), a group for which I've volunteered for a couple of years now. It maintains a fantastic philatelic museum in Ohio, featuring at least two million postmarks. (That's where the signs and my printed-out photographs go!) Or, get in touch with me and I'll think of something. This is not intended as a shameless plug, I swear. Above: Postmark from the discontinued River Street Station, Paterson, NJ. Obtained while driving from NYC to Ohio. Why postmarks? They're really small pieces of history. This mail-piece was in X place on Y date, and the postmark proves it. My father's been collecting them since 1960 and I've more than doubled our collection over the past three years. We now have 8,500 overall, from every corner of the country. Of special interest are last-day postmarks, from the final day of operation for a post office that is discontinued or suspended. The difficult part has been to find out about postal closures in advance; while the [old] Post Office Department used to announce them in advance, it is now exceedingly difficult to obtain a national list with such information. Since it's public information anyway, this development is disappointing. So if you'd like to help either my father's-and-my collection or a real-life museum, please let me or the PMCC know of impending closures / suspensions or actually forward us an item with a last-day postmark on it! I might inaugurate a PO Box for this purpose. Last-day cancellation from Spot, NC. Courtesy the PMCC. Every post office has a hand-cancellation device [that is not always, but should be] unique to its facility. Once an especially cool Postmaster signed the card for our collection along with her clerk and rural carrier. I've also gotten autographs from [Postmasters] James Bond and Marge Simpson! Don't let the rumors scare you. It is not true that "it is illegal to take a photograph of a federal building." You can take a photo of whatever you darn well please so long as you're on public grounds, and you can see anything using Google Street View anyway. Snap away! (If you're out on a street anyone has the right to ask you what you're doing, but no right to impede your photography or confiscate your film. When I visit POs I always go in and get my postmarks first so Postmasters know my story.) Taking photos inside is a different story -- let's not go there right now. Below: The Massey, Maryland post office is in danger of closing. The PMCC Museum has what I believe is the world's largest collection of post office views (old postcards, etc.) and printed photographs: more than 50,000 in all. It's quite astounding! You can submit your own photographs to myself or the other webmaster at postmarks.org; we've got a two-year backlog but will definitely get to them all eventually. See if you can learn about the history of your local post office. In small towns, Postmasters often know a lot about it, or can direct you to someone who can. Feel free to share the information with me, and I'll do my best to both preserve the memories or even feature your stories here! My efforts have yielded a couple hundred fascinating name origins and stories from all corners of the nation. There are certain items that you can never legally get your hands on, like blue USPS collection boxes. (It's in a postal manual that they must all be impounded and recycled or sold for scrap metal.) However, some other non-sensitive items from discontinued facilities can be sold off. 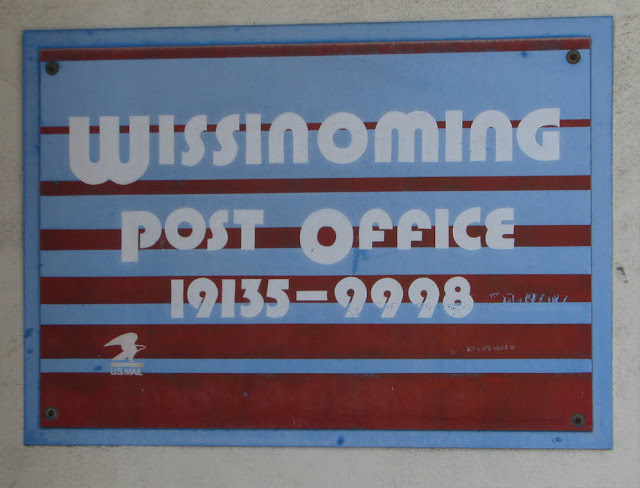 Items like site-specific postal signage (along the lines of "U.S. Post Office // Wonderful, Wyoming") are semi-restricted; they will usually be destroyed, but can be donated to recognized non-profits under certain conditions! The organization I volunteer for, the Post Mark Collectors Club, qualifies, and I've been able to get two post office signs donated to the group's museum for preservation. I was going to write about the exact procedure, but let's just say it's in USPS's handbook AS-701: Materials Management. Essentially, you need a formal written letter from an officer of the non-profit stating the item and intent, and permission needs to be granted by an appropriate local official as well as the USPS Postal Historian. 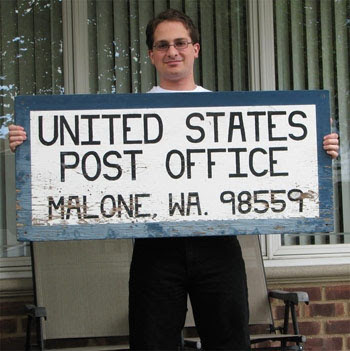 Here I am holding the sign from the discontinued Malone, WA post office -- the first post office to be replaced by a VPO. The sign currently resides in the PMCC Museum. Again, it's a piece of history. My thanks to the wonderful people at the Seattle District, Philadelphia post office, and at the Historian's office in D.C. for allowing these signs to be preserved at our museum! Which sign would you like to see preserved, were it to close? By and large, only folks within the Postal Service read the bi-weekly Postal Bulletin. Heck, they're supposed to read it because the Bulletin informs them of all new postal regulations changes. Regardless, Bulletin issues are available to the general public and I follow each new issue closely to find out whether any changes affect my hobby-work, which post offices USPS wants to announce the closure of (after the fact) this time around, and see what interesting pictorial cancels I might want to mail out for in coming weeks. This announcement states that the West York post office, a branch of York, was officially discontinued September 10, 2011. There's just one problem, and it's one I'll admit to never having seen before in a Postal Bulletin -- it's not closed. I know this because I was sitting in their parking lot on November 22, listening as my NPR interview aired. I got their postmark and, of course, photos of the office, too. The West York post office is in a strip mall and open from 8AM to 6PM weekdays, and 9-2 Saturday. I can't think of any reason they would close this in the near future. I'm open to the possibility that I might be missing something... Do any readers have ideas as to how this happened? Welcome, BBC viewers / web-watchers! 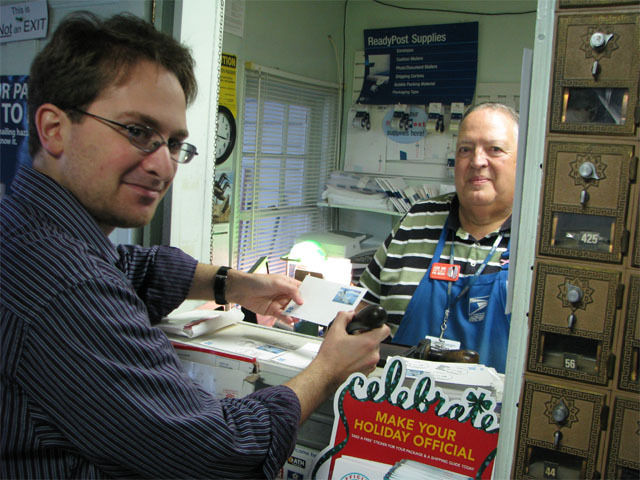 When my NPR radio segment aired a month ago, I was approached by the BBC and challenged to find them a quaint little post office in the general D.C. area. They would interview me there, show me getting a local postmark, and film a bit of bantering with the Postmaster. 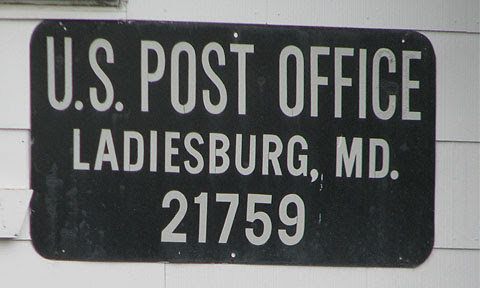 I chose Ladiesburg, Maryland, a town NNE of Frederick and an hour and a half outside D.C. Its post office is one of 42 in Maryland that could be closed in the near future as part of the RAOI "Expanded Access" initiative. While I hadn't been inside, I had passed by the building late on a Saturday so I knew it was quaint, and I also knew the Postmaster was friendly and familiar with the history of the town. Fortunately, permission to film was granted and we were set for a Tuesday. I drove down from Philly to Silver Spring and stayed with family friends the night before. 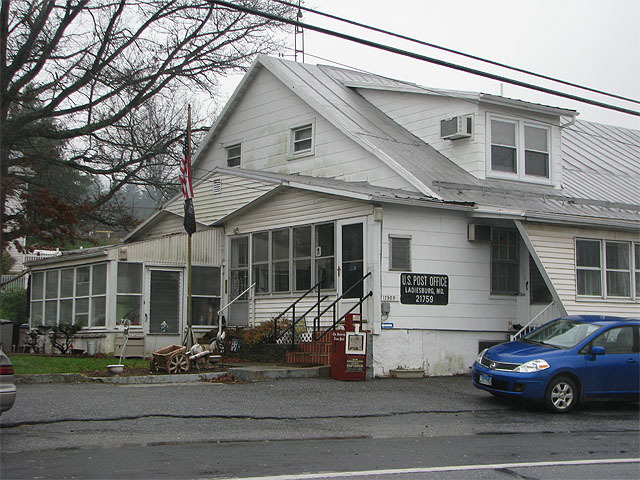 In the corner of a house, the Ladiesburg post office represents the last business in this small Maryland town. There are tracks behind the building and the town used to have a station, a general store, and several other goodies. Now, the post office is all that's standing between Ladiesburg's present stature as a community and a happenstance cluster of houses. The official local story has it that the first eight residents of the town included seven women alongside one man. Hence, Ladiesburg! I love origin stories such as this, and if you don't know a local historian, the Postmaster can be your best bet to discover how a town got its name. Let's look at some pictures! A slightly disheveled me with Postmaster John T. ("Tom") Chuvala. This was at the end of the media session, which lasted two hours. Somehow I was still energetic after four hours' sleep, though I think here I was too exhausted to smile fully! The Ladiesburg post office is open 8 - 12 Monday through Saturday. Postmaster Tom has headed the office since 2006. On Saturdays his Postmaster Relief (PMR) fills in. Both are veterans; as Postmasters they are continuing their service to their communities and toward binding the country together. Two miles down the road lies the town of New Midway, another morning-only office that's under study for closure as part of RAOI. Here I found another photogenic office along with a wonderful Postmaster and some unique P.O. Boxes whose manufacturer I have never seen before. New Midway featured a train station as well, and this office is right alongside the tracks. Across the street is, of all things, a piano shop. [Link: Kramer's Piano Shop.] How cool is that? It's something I definitely hadn't expected to see in such a small town. The local elementary school is here as well. Hope you enjoyed this small slice of America. I was saddened when the results to my recent FOIA request to USPS came back -- not because they didn't send me what I asked for, but because I saw the small-town post office in Lemhi, Idaho has received a Final Determination notice, meaning that its closure is imminent. This little corner of Idaho is sparsely populated, but has a big place in history that is little-known: Lewis and Clark crossed the Continental Divide at nearby Lemhi Pass; this is where the first American flag was unfurled west of the Rocky Mountains (a nice page for road trippers, by the way). 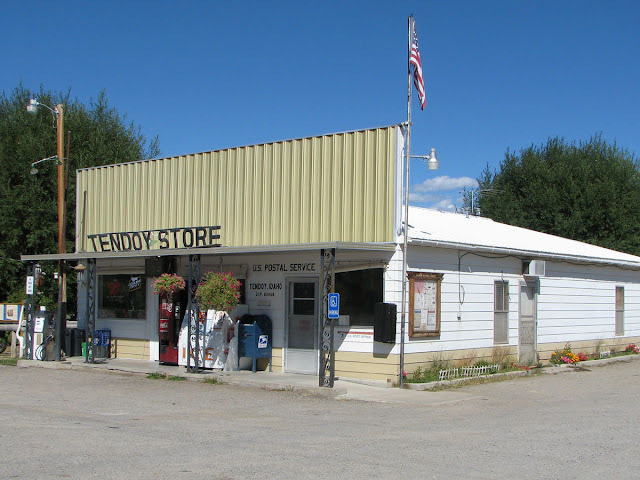 This is General Store country, and this rural stretch of Idaho State Route 28, which runs through a stretch of valley at the edge of the Rockies, offered me four post offices over the 120 miles on which I drove it (from Terreton to Salmon) -- three of which are in general stores, and two of which are in towns so small that Google Maps won't even present them to you unless you're zoomed rather far in. Leadore (think mining; lead ore) was presented once before on this blog, but I think it's worth another look. This is located in a beautiful old general store with a wooden false front. See if you can make out the fantastic hand-carved wooden sign denoting the P.O.! The town's population lies just south of 100. I saw not a building on this road for 18 miles until I hit the unincorporated town of Lemhi. And once I found this post office, I didn't see anything until that of Tendoy! The town, and Lemhi County, are named after a local native Shoshone tribe that was pushed to a reservation in 1907. There are people who live around here; it just takes a satellite view to show that their houses and ranches are off the main road a bit. If you do take a look, you can even see the circular rings caused by central sprinkler systems! It's a shame that the Lemhi post office will be closing. Tendoy, eight miles up the road, is another place you wouldn't see coming if you didn't otherwise know it was there -- again, this is the main building in town. I was thankful to come by Tendoy, partly because the friendly folks there filled up a water bucket with which I could really clean my windshield, which was getting splattered and battered during a late-season surge of insects. It's nice to be able to admire landscapes with your visual sight lines unobstructed! The end of this journey takes us to Salmon, Idaho, the seat of Lemhi County and the biggest town for many miles around. Baltimore, MD: Druid Station; one of 307 post offices removed from the RAOI closure study. As part of my academic studies and preservation efforts, I have sought accurate and up-to-date information as to the status of post offices across the country that have been considered for closure. I recently received a response to a Freedom of Information Act request, submitted to USPS, for data regarding offices being studied for closure that are, for the time being, officially safe. I thank USPS for responding to the request in good faith. Back in 2009, USPS listed 3,200 postal stations and branches for study for potential closure, as part of what was known as the Stations and Branches Optimization and Consolidation Initiative (SBOC). Approximately 160 offices were eventually discontinued as a result of the procedure. Every two months or so, USPS published a list on its website -- accessible to the public -- detailing which offices were still being eyed for closure. The final list, published February 2010, was essentially a list of which offices would be closed. Most were discontinued by the middle of 2011. The present Retail Access Optimization Initiative (RAOI), which lists 3,700 post offices for potential closure, has not similarly been revised on USPS's website since its publication in July 2011, so I filed a FOIA to obtain a report of progress for the project. A few months ago it was noted that the Alaska [Postal] District was the first state to have completed the majority of its RAOI study. This made sense, since most of those offices are in remote towns inaccessible for most of the year except by way of plane, and those post offices had to stay open. Over the past few months more Districts have completed their studies, which are by no means over. Official closure notices have been filed in many parts of the country, while in other parts these postal Districts are still conducting their mandated public hearings. The following list states all 307 post offices whose closure study has officially been stopped; that is, these offices are definitely safe for the time being. Offices not on the list may not have yet been fully evaluated, though many will indeed be closing in the near future. I feel fortunate that I was able to visit the Mahanoy Plane Post Office before it closed, likely for all time. It has not been officially closed -- discontinued -- by the U.S. Postal Service, but the facility was one of 203 in the state of Pennsylvania being studied for closure as part of its Expanded Reduced Access initiative back in July. 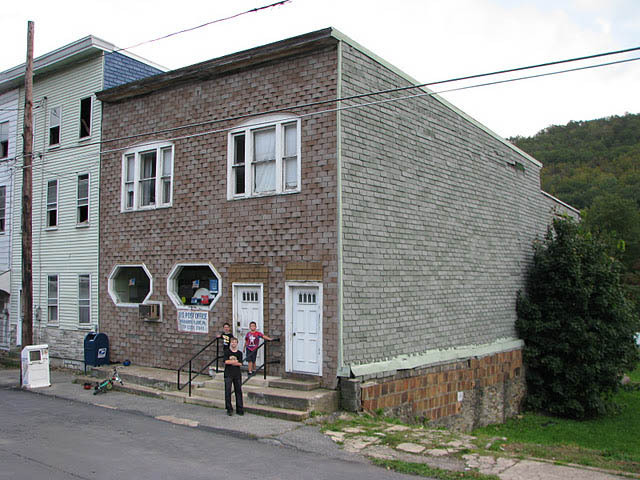 The landlords of 312 Main Street, Jack and Rose McCarthy, are said to have decided not to have extended their lease to the post office, according to the Pottsville Republican-Herald in an article dated Tuesday, November 29. The Mahanoy Plane post office was suspended November 30, at the expiration of the lease. While it's possible that USPS will look for an alternative site for the post office, history has shown that this is rarely the case. Residents, who must presently pick up their mail at the neighboring Frackville, PA post office, have been seeking to get home delivery of mail at mailboxes at the front of their house. USPS would rather the townspeople find a site for one or more cluster boxes, so that the postal service only needs to deliver to a handful of sites, while Mahanoy Plane residents would have to walk to pick up their mail. Here is the link to the full Republican-Herald article. Earlier this semester, back before the sun set at 4:30, I'd taken a weekend to explore this slice of coal country about 40 miles WNW of Allentown. What I found were some small towns, some surprisingly large communities, and a few quaint post offices. I think some further photos of this trip -- featuring the towns of Mahanoy City, Shenandoah, and Lost Creek -- are worth a post. Mahanoy Plane lies in a valley between two mountain ridges (see Google Maps terrain map, below). According to the kids, one of their summer joys is the overflow of the creek that runs by town -- if it rains. They say it's possible to swim in the waist-deep water that runs down Main Street (which is adjacent to, but separated from, the main drag that runs by the town. I can't verify that it's indeed true, but it's a great story nonetheless. The Mahanoy Plane Post Office was established September 20, 1864 with Charles E. Byers as its first Postmaster. The office was staffed with an Officer-in-Charge at the end; that honor has been Carol A. Kowker's since last April. While researching the location of the Mahanoy Plane post office using nearly any USPS tool, you might be led to the grossly inaccurate conclusion that it is located in Mahanoy City, PA, which is 5.5 miles away. I found the same shoddy information was on the USPS WhitePages Locator tool and USPS's Mobile App, though the office was well placed with the USPS Everywhere Locator.